Occupy Wall Street is best understood, I would suggest, as a new form of what could be called “political disobedience,” as opposed to civil disobedience, that fundamentally rejects the political and ideological landscape that we inherited from the Cold War. Civil disobedience accepted the legitimacy of political institutions, but resisted the moral authority of resulting laws. Political disobedience, by contrast, resists the very way in which we are governed: it resists the structure of partisan politics, the demand for policy reforms, the call for party identification, and the very ideologies that dominated the post-War period. 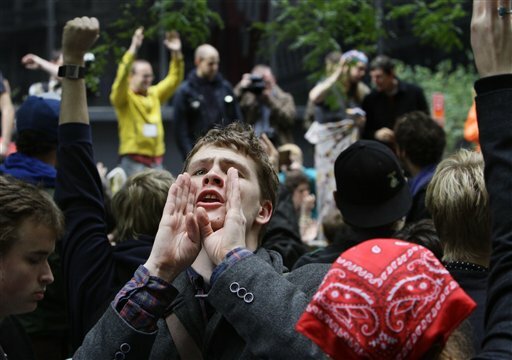 Occupy Wall Street, which identifies itself as a “leaderless resistance movement with people of many … political persuasions,” is politically disobedient precisely in refusing to articulate policy demands or to embrace old ideologies. Those who incessantly want to impose demands on the movement may show good will and generosity, but fail to understand that the resistance movement is precisely about disobeying that kind of political maneuver. Similarly, those who want to push an ideology onto these new forms of political disobedience, like Slavoj Zizek or Raymond Lotta, are missing the point of the resistance. I do, however, want to recommend Harcourt’s trenchant thesis as food for thought about what #ows and the occupy movement generally means.This does look like something that isn’t just going to explode and vanish all at once like the colossally ineffectual anti-Iraq war movement of 2002-3. Last night’s successful battle for the park demonstrated that the protesters have struck a cord in a wide swath of sympathizers–union members, unemployed people, struggling members of the shrinking middle class, students–many of whom were ready to run out in the rain and get arrested for the first time in their lives for this cause. If there is no tangible “Occupation Manifesto” where helpless media pundits can find the answer to their dumb questions about what these crazy kids want, I think Harcourt is absolutely right that this movement is driven by one crystal clear conviction: the entrenched political system is too corrupt to negotiate with. The movement is not an appeal to the government, in which the occupiers clearly have lost all confidence, but to the “subjected” people of the nation (and the world). Some questions I’ve been asking myself, which I’m sure others are asking: Is this the beginning of a real political revolution we’re witnessing/participating in, a revolution in the 1776-1789-1917 sense of the word? Is the political system we’ve known all our lives really being legitimately challenged by an alternative system, even if the characteristics of this alternative are yet to be fully formulated, let alone even conceived of? Or is this “paradigm shift,” if that’s an accurate description, more along the lines of the 1960s counterculture, a critique of the status quo and a dream of an ultimately ahead-of-its-time alternative, the most commercial parts of which can be easily coopted, tamed and exploited by the dominant culture? I’m eager to find out. Which side will the people be on, if this really is a revolution? This entry was posted in Democracy, Politics and tagged #OccupyWallStreet, Anarchism, Bernard E. Harcourt, Freedom, government, justice, revolution, Slavoj Žižek. Bookmark the permalink. The faces change, but the tactics remain the same. the new boss will be the same as the old boss. That’s the way it always seems to go. But I would be willing to give the new boss–or worker-owned management–a try rather than hope the old boss changes his ways.